When our children are in their preschool years they often have many opportunities to socialise with deaf and hearing impaired peers through playgroups and other activities organised by the early intervention provider. With the available technology today, newborn screening and quality intervention programs, many of these children go on to attend their local mainstream school with their siblings and other neighborhood friends - which is great! The down side to that is that often the deaf/hearing impaired child maybe the only one in their school who has a hearing loss. In today's busy lifestyles often times it is tough for families of deaf/hearing impaired children to get together regularly. One of the co-founders of CI Circle, Karen, found that her daughter was keen to make contact with other teens who have cochlear implants to be able to chat with them and share experiences. 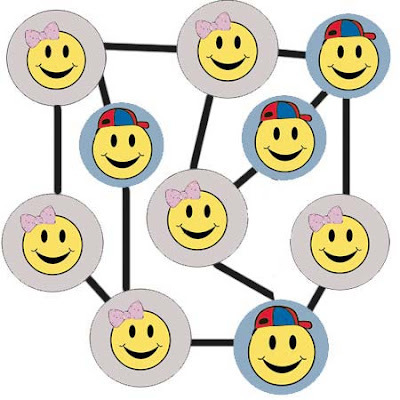 And so mother and daughter have joined forces to create CiCircle4Teens. Please note that this is a forum for teenagers (12 year olds may apply) but strictly NO ADULTS. In the interests of screening members to ensure the protection of the teens using the new forum, please contact the list owners directly for more information about subscribing to this list. Today was a very special day for my family, personally. 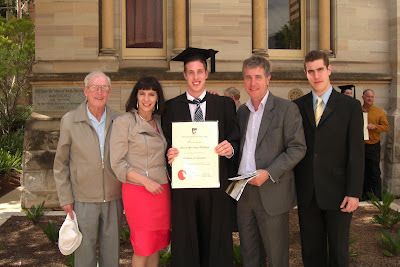 Almost twenty years ago when my youngest son, Alexander, was diagnosed with a profound hearing loss I did not expect that he would graduate from high school with his SACE, after having been mainstreamed from Reception. For some time in the early days, my husband and I didn't even think that oral language was a realistic option for him. So today, when he walked out in his academic gown, to receive a Bachelor of Economics at the University of Adelaide, you can imagine how our hearts swelled, and how once again we said silent prayers of thanks for the brilliant, selfless Professor Graeme Clark, who invented the multichannel cochlear implant and put a huge chunk of his life into constantly improving it, so that the quality of life for thousands of deaf adults and children around the world could be immeasurably improved. The potential outcomes for children born deaf and hearing impaired today are so different from twenty one years ago, when Alex was born. Dream ambitiously for your children - your dreams are not unrealistic. And if your greatest dream is for your child to be happy and have a caring nature then you're probably already half way there. Article written by Alex's mother, Robyn. Editors Note: Alex was born with a profound hearing loss in 1987. At that time cochlear implantation was not readily available, and in fact wasn't until Alex was 3. At that point in time, despite intensive therapy and a lot of work by both of his parents, Alex only had a vocabulary of about 50 words. The vast majority of his words were only intelligible to his immediate family. When the opportunity for a cochlear implant became available his parents travelled interstate (about 9 hours each way) first for him to have his surgery and then for him to attend follow up mapping appointments. They continued to do this until a program was set up in their home state that Alex could access. In fact so passionate did Alex's mum become about supporting deaf children, she went on to train as a teacher of the deaf and then became a certified Auditory Verbal Therapist, and is now Clinical Program Manager of the Cora Barclay Centre - the service that supported Alex for all those years! Ever had one of those days? You know the kind of day when the alarm doesn't go off, then you have a fight with your partner, your kids won't get out of bed, then fight non-stop when they do? Things just keep going wrong and by the time you get to work you are exhausted and your brain is frazzled. It is always those days that you manage to make a stupid mistake - not intentionally and not because you don't know the rules, just because on that day you were not at the top of your game, you were distracted and you just screwed up. I'm sure all of us have had at least one of those days. How ironic is it then, that if the person having a bad day happens to be the teacher of our deaf/hearing impaired child, all that empathy just flies out the window? Where our children are concerned somehow we manage to lose sight of any rational thought process and go purely to maternal/paternal protection of our young. Whilst this is a deliberate over exaggeration, it does highlight the fact that we as parents sometimes can be guilty of coming on too strong, or "riding" our children's teachers too hard. If your child is in the very early years of schooling, helping out at school can be great for you, your child and the teacher. When you offer to go on field trips, help out with cooking/craft classes or other such things, make it clear you are just another parent there to help out. That way the teacher doesn't feel as if you will be hovering over your own child, checking up on the teacher to see if he/she is doing all that you think he/she should be, but rather you will just be there to help out. Taking the pressure off of your child's teacher by helping others in the class means a better deal for your child in the classroom too. It also gives you a great opportunity to observe your child and how they are coping in the mainstream classroom. You can observe how your child is included, and also to see just how everyone else's hearing children behave/cope in the mainstream classroom. Same if you volunteer to go into the class to listen to children read - don't listen to your own child, you can do that at home anytime. Listen to all the other kids, then in your head you can gauge how your child is doing both in reading skills and in the vocabulary they use at home compared to their class peers. You might just be surprised at how impressed you are with how your child is doing. Whilst parents are most definitely the expert on their own child, they are not the trained educators, nor are they responsible for managing the dynamic of all those other kids all together in the classroom with your child. Don't be afraid to let teachers know that - you recognise what you have to offer but also recognise their experience and knowledge and see that working together as a team with them, will be in the best interests of your child. Make no mistake these people spend many hours with your child in the classroom, it doesn't do any good to make an enemy of them. I also believe that the vast majority of teachers see their profession as a calling and really do want to do the right by your child. They may not always get it right but I do think they are, for the most part, really trying to do just that. If you find things are not working well in your child's educational placement or in their Early Intervention (EI) team, then of course as a parent you need to intervene. Here is where paernts need to learn the difference between assertion and aggression. The Macquarie Dictionary defines assertion as "to state as true; affirm; delcare. To maintain or defend (claims, rights etc). Aggression is defined as "offensive action or procedure; an offensive mental attitude; the emotional drive to attack"
It is absolutely the parent's role to advocate for their child and to ensure that their child's needs are being met. It is asbolutely not ok for parents to become aggressive or abusive towards people involved in the care of their children. In fact to do so is counter productive. If a ranting parent goes off at the professionals involved and it is witnessed by all, then it is easy to right the parent off as a "loose cannon, an overly emotional out of control parent". Aggressive people are "never wrong"
However the parent that is calm, rational, well informed and eager to engage in dialogue with the professionals in a bid to find a solution that works, so much harder to simply dismiss. Rather than try to deal with a situation when you are angry, walk away and give yourself time to compose yourself. Gather your facts - information is power! When you are going to a meeting involving your child, do your homework. This is where time spent in the classroom by you is so invaluable. Sometimes our kids suffer from being under the microscope; their every move scrutinised and sadly often put down to their hearing loss. Your time spent in the classroom will enable you to confidently discuss what you know to be age appopriate behavioural issues that are present in many others in the class, as opposed to issues that may be specific to your child or their hearing loss. Get all the information you need and make summaries of pertinent points you want to raise, giving copies of the summary to all those attending the meeting. That way you can move through your list, and if people try to go off topic with irrelevant arguments, you can pull them back to the "mini-agenda" you have in hand. A parent that presents as well informed, especially in relation to legislative requirements and existing precedents in the school district of concern, has far more power to persuade. It won't take long before the professionals attending can see that many of their "old arguments" are not going to work and that this parent isn't going to take "no" for an answer and so they had better knuckle down and try to find a mutually agreeable solution with the parent. Similarly parents who present in this way, might not be "liked" as such, but they will be respected. They will gain rspect by being steadfast in their resolve but in a calm and rational way, and this gaining of respect has positive implications for future dealings with the same personnel. As the old saying foes "sometimes you can catch more bees with honey".